Ballarat Farmers Market and Brown Hill Market! These markets feature the same management & core stallholders. They operate on the Second Saturday at Lake Wendouree (Ballarat Farmers market) and the Fourth Saturday at Brown Hill Hall (Brown Hill Market). We operate all year round – including in the winter – so you have regular access to our wonderful stallholders. Note that some stallholders only come once a month, and others have highly seasonal produce, so the range of stalls varies at each market. We hope you have a great experience visiting our markets! Thanks for supporting our hardworking and creative stallholders who bring such a wide range of fabulous produce & products to the market. A market hamper raffle is drawn at 10 am and 11.30 am. Entries are just $1 or FREE if you are a first-time visitor to the market! 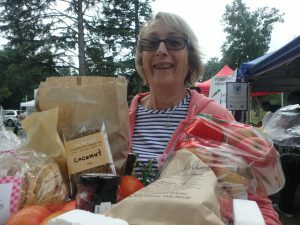 Hamper contents are donated by our generous stallholders, so winning the hamper gives you a wide range of products from our many different stalls. Each donating stallholder also gets a free ticket in the draw. Stalls include: both organic & non-organic fruit & vegetables, bread & cakes, meat, cheese, dry goods (spices, grains & pulses), vegetarian baked goods, jam, mushrooms, wine, honey, healthy snack bars, hot food (Indian, sausage sizzle, pasties, meat/pork/breakfast rolls, dumplings, vegetarian sausage rolls, potato twirls, and much more!). Some of the other options from our stallholders include steam-punk jewellery, dog portraits, vegetarian dog treats, vegetable and flower seedlings, bulbs, native plants, fresh ground locally blended coffee, tea blends, second-hand books… and lots more! Yes, we always have a coffee van on site! Remember, the stallholder range varies with the seasons as one of our priorities is to create outlets for local and seasonal producers. Some of our producers come just once or twice a year, so you never know what you’ll find! 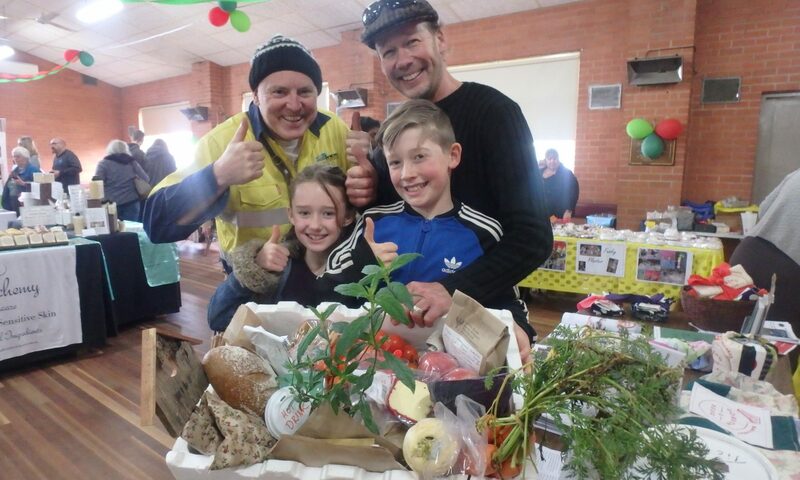 Most of our wonderful stallholders donate an item or two toward the hampers. We create two hampers which are stuffed full of fresh produce, fabulous products and vouchers for hot food, drinks and discounts. Every stallholder who donates gets a free ticket in the draw. The hampers vary market to market, but are usually well over $100 retail value. Tickets are only $1 or FREE to first-time visitors. The hampers are drawn at 10 am and 11.30 am, and winning one will definitely make your day!